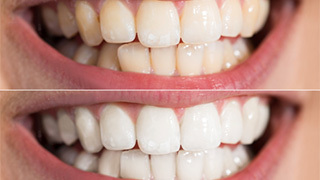 Are you tired of hiding behind dull discolored teeth? Ridgepointe Dental can bring new life to your smile with teeth whitening in the Colony. Unlike over-the-counter products, our specially formulated whitening agent deeply penetrates your enamel to resolve tough stains to give you the drastic results you desire. We offer two convenient solutions to restore a bright, white smile that lasts. You cannot avoid tooth discoloration because it is a natural part of the aging process. Over the years, your enamel becomes thinner, causing more of the yellowish dentin to be more visible. When you combine age with outside factors, like darkly pigmented foods and drinks, poor oral hygiene, or smoking, your teeth can lose their bright white appearance quickly. At the first sign of discoloration, you likely tried a few over-the-counter products, but you were left dissatisfied with the results. Although they are convenient, they do not contain professional strength whitening agents, so they only slightly improve surface stains. The only way to get the noticeable results you want is with the help of your dentist in the Colony. We offer two convenient treatments to find the right solution to meet your needs and your lifestyle. The Zoom! whitening system provides fast results. 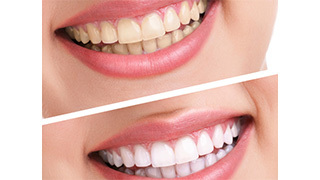 In fact, your teeth can become 8 to 10 shades whiter after just one appointment. After placing a protective barrier on your gums and lips, we apply a highly-concentrated whitening agent to your teeth. A special light is used to activate the whitening molecules to resolve the stains. Now, you can also whiten your teeth around your own schedule. Our at-home kit gives you everything you need to achieve in-office results. We provide you with custom-fit trays to ensure the even and consistent distribution of the whitening agent. You use the at-home kit for about 2 weeks. As each day passes, you will notice your teeth becoming several shades whiter. Your new smile can stay bright for several years if you take the time to care for it properly. For the first 24 to 48 hours, it is best to stick to a white diet because your teeth are more susceptible to stains. Choose foods white in color, like yogurt, plain chicken, or rice. Besides maintaining your oral hygiene, you can prevent future discoloration by limiting your contact with stain-causing foods and drinks. If you cannot skip your favorite cup of coffee or berries for lunch, brush your teeth right away or rinse your mouth with water. It is also best to avoid tobacco in any form. If a dull smile has hurt your self-esteem, you can revamp your confidence with the whitening treatment that is right for you. After an initial consultation, we will discuss your options to help you reach your desired results. Contact our office today to schedule your appointment for a bright smile.